I am turning over a new leaf. Changing my ways. Proving you can teach an old dog new tricks. Whatever. I am going to get rid of my notorious black thumb and turn it into a green one. With water, sunshine, and any luck, this will be a sunflower house. The idea is that sunflowers will grow where you see the dark soil, and you enter in the "door" and stand in the middle of a bunch of sunflowers. The kids and I planted this today, and though I did the major digging because the dirt is hard, they had fun and are eagerly anticipating their sunflower house. The beginnings of a garden fence. It's bamboo we used at the apartment to make our balcony more private. We are re-using it to fence off a section to grow food! It will actually not curve at the top but continue to the fence. The little palms will get moved so we can plant an orange tree, and maybe an avocado tree too. Baby Watermelon plants. Dan converted the sprinkler that's within the fence to a drip system. 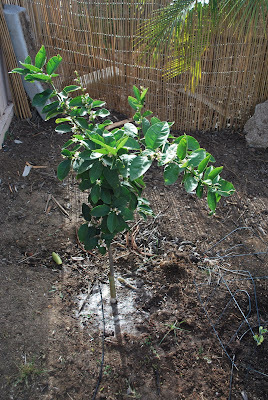 Two Lemon Trees planted together. One was here and gave us a few lemons last year. 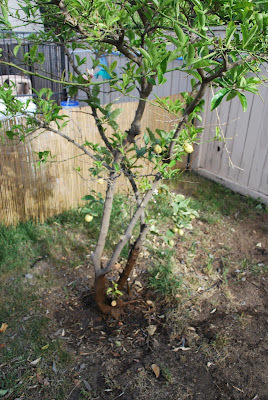 One we planted with the existing one and it has at least a dozen growing lemons. We think we weren't giving it enough water, so hopefully things will speed up now. The Lime Tree. We planted it when we moved in last summer also. There are 4-5 limes that should be ready soon, and TONS of lime buds. Why are my lemons striped? Anyone know? They appear to get more yellow and less green as they mature. Maybe when they are all yellow they are ripe? Next project: A compost pile, lettuce, onions, and strawberries. Oh, I love that ya'll can grow fruit trees!!! We can grow pecan trees but when the pecans fall, our dogs eat them and get really bad gas. It's just not the same.